One of the greatest challenges of whiplash type injuries is the typical injured structures are what is classified as soft tissue. These types of injuries most often are not easily displayed on typical tests like x-rays or MRIs. This can be a problem for the average doctor to who is caring for an injury victim to scientifically prove the injury and to be able to show the patient’s improvement. 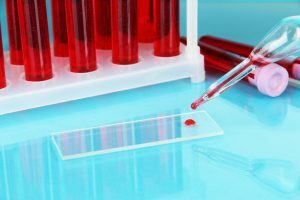 Fortunately, there is a simple blood test that can help to document the patient’s injury. JW Pritchett published a study in the American Journal of Orthopedics(1) in which a blood test of C-reactive protein or CRP, which typically indicates inflammation, was increased in with ligament, tendon and disc tears 48 hours after an injury. It was noted that samples taken prior to 48 hours missed the elevated levels. The research noted that the the greater the level of damage, the higher levels of CRP in the blood. Normal levels of CRP are considered 1.0 mg/dl for 99% of people. Pritchett also noted that patients with no documented tears on MRI had CRP levels below 1.0mg/dl. While those with tears had a CRP level that stayed about 1.1 mg/dl. Another study performed by Sterling M, Elliott JM, Cabot PJ,(2) measured CRP of 40 WAD victims compared to 18 healthy controls. Serum samples of CRP were taken within 3 weeks of trauma and then again 3 months after trauma. The test demonstrated the following. 1. All WAD victims showed elevated CRP compared to the controls. 3. By 3 months post injury CRP levels in recovered participants and those with only mild disability were no different from controls but remained elevated in participants with poor functional recovery indicating ongoing low-grade inflammation in this group. 4. CRP levels showed moderate correlations with some sensory measures including mechanical hyperalgesia (lowered PPTs) both locally over the cervical spine and at a remote lower limb location as well as with thermal (heat and cold) hyperalgesia. Other causes of an elevated CRP to rule out would include: burns, infections, heart attack, inflammatory bowel disease or chronic inflammatory problems like lupus, vasculitis or rheumatoid. * Direct correlation between increased CRP levels and lower pain pressure threshold as well as decreased tolerance for heat or cold. 1. Pritchett JW. “C-reactive protein levels determine the severity of soft tissue injuries.” The American Journal of Orthopedics 1996; Nov:759-761.